Plug and Play – Simply load content onto a USB stick and insert into the display. Once the files have copied remove the USB stick and images and videos will play in a loop. Each screen has its own separate media player built in. Commercial Grade Screens – Designed for commercial use and built with high quality components the screens can be used 24/7 and have a lifespan of 50,000 hours. Complimentary Scheduling Software – Allowing you to take ownership of your display; choose what is displayed on your screens and when it appears. Internal Locker – Should you need to run the screens from an external source, like a PC, you can do so by using the HDMI or VGA inputs. There is a space to fit a small PC inside the lockable compartment. Power Timer – You can set daily, or weekly, On/Off times for your displays and completely remove the need for user interaction. 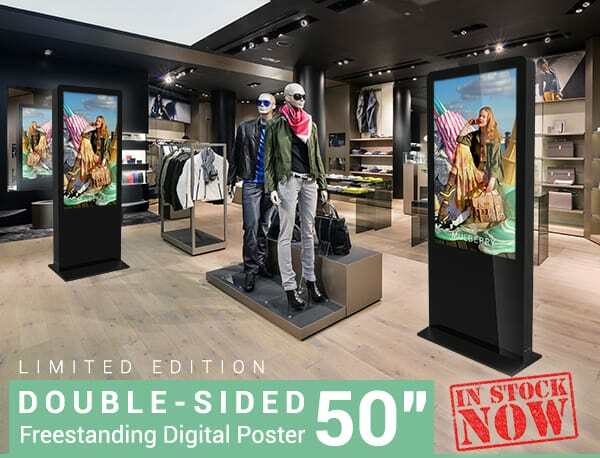 We have stock of the 50” Double Sided Freestanding Digital Posters and they are available for immediate dispatch. Get in touch today to take advantage of these limited edition displays. For the latest prices and special offers give us a call on 0121 421 4458.